If Mooring Belts Are Made Slack Prior To Major Storms, Belt Movement Will Be Reduced. Gravity Weight Anchors Are Sized To Prevent Vertical Mooring Line Overload. They Will Lift Off The Seabed Under High Mooring Line Load And To Return To Their Seabed Origin On Guide Piles. 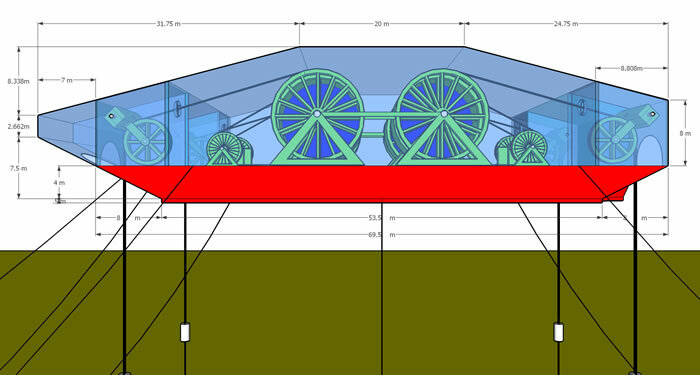 the Super Watt Wave Catcher Barge© Presentation, and the Super Watt Wave Catcher Barge Overview. Super Watt Wave Catcher Barges© are flat bottom barges that ride the water's surface and use their mooring lines to turn generators located inside the buoyant bodies to generate electricity. The tops of these mooring lines are likely to be steel wire reinforced rubber belts, like the rubber timing belts on cars and trucks, that go over large diameter pulleys on their way to power large generators. These belts are resistant to the numerous cycles of varying wave loading and sea water splash zone corrosion. The generators can be of any type known to those familiar with the art. They can be rotating generators, linear generators, hydraulic pump driven generators, compressors, etc. Super Watt Wave Catchers Barges© use the high vertical drag coefficient large flat barge bottoms to catch as much vertical wave pressure as possible by a single floating structure. The barge bottoms have increased vertical and horizontal drag coefficients over flat plate bottoms increasing both vertical and horizontal operational wave forces on the barge. The pressure on the barge lifts the barges up on swell waves almost the height of the swell waves and causes the barge to move horizontally every 5 to 10 seconds with the wave period. The barge's resulting high vertical mooring line loads apply torque, to the 12 meter diameter flywheels on the barge, that is roughly 6 times the torque needed by the new direct drive wind turbine type generators. When the generators are a rotating type, the steel wire reinforced rubber belts first go over large diameter articulated pulleys, then go over large diameter uni-directional pulleys, then wind large recoil springs located inside large diameter flywheels. 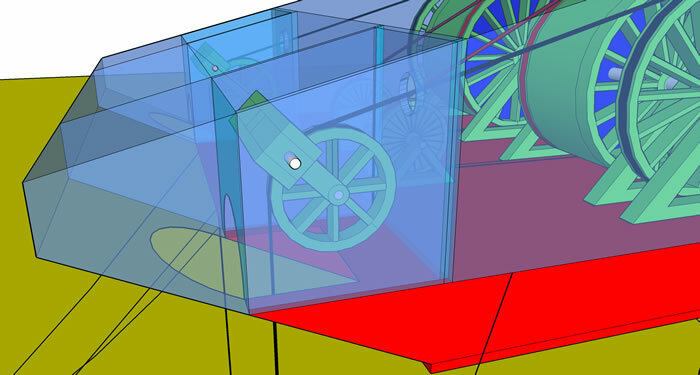 The stored torque in the recoil spring and flywheel combination finally turns the rotating generators. The forces in the mooring belts are large enough to turn large wind turbine generators. All equipment is located under a water tight enclosure on top of the barge proving a safe dry area for equipment preservation, maintenance and wear part replacement. The use of large diameter low friction bearings in these systems provides minimum mechanical losses and maximum belt life. Mooring lines and mooring belts can be replaced offshore leaving very little reason left for returning the barge to port for maintenance other than hull recoating every 30 years. Steel wire reinforced belts are likely to be used since they have proven to have long lives in all sorts of applications including car and truck engines. Rubber is also resistant to sea water corrosion. Offshore platforms have successfully used reinforced rubber coatings in the splash zone areas for decades. Rubber's long term resistance to seawater is best indicated by airplanes on the decks of sunken World War II aircraft carriers that still have air in their tires. The Super Watt and Original Wave Catcher Barges© both use two similar size steel wire rope reinforced belts at each corner of the Wave Catcher Barge. Both belts are 100% redundant allowing each belt to be replaced independently and providing a backup in case one breaks or is weakened. The steel wire reinforced belts first go over a large diameter articulated pulley which is needed to accommodate various mooring line angle changes under the range of possible vessel motion while at the same time maintaining the belt in the center of the pulley and not subjecting the belt to wear or fatigue. Large diameter pulleys maximize belt life and minimize mechanical losses. 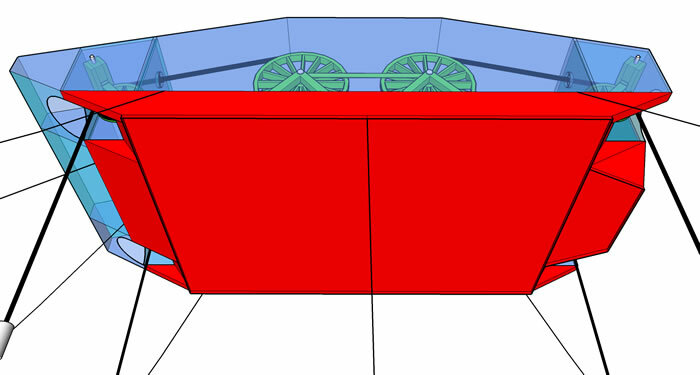 The articulated pullies are ideally oriented to be parallel to the wave direction so that belt inclination due to vessel offset is automatically accommodated by the curvature of the pulley resulting in the lowest possible transverse belt and pulley loading and the longest system life. 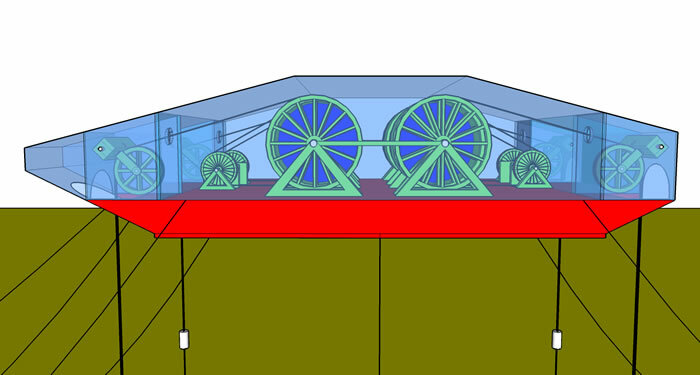 Articulated pulleys are cantilevered over the edge of the barge maximizing the available flat area of the barge and maximizing the resulting uplift forces and the power generated. 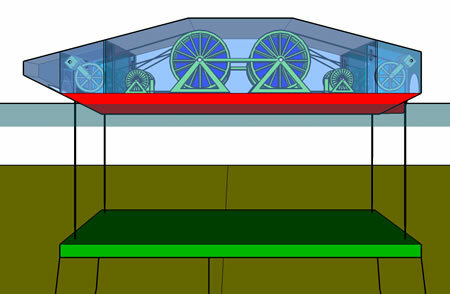 The Super Watt Wave Catcher Barges© mooring belts pass through inclined pipes leaving the water tight enclosures. These inclined pipes with wiper seals insure that water on the belts drains back into the wet room maintaining a dry enclosure. 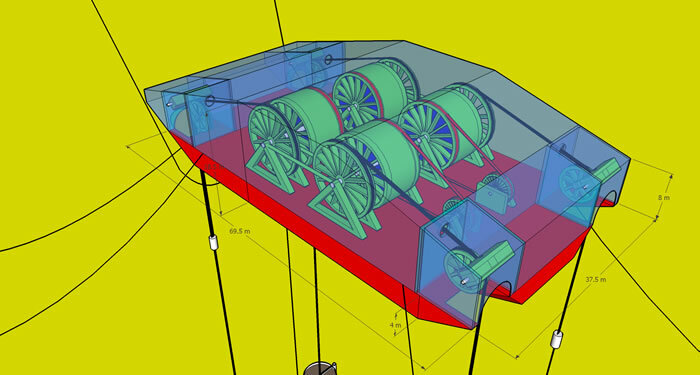 Large diameter uni-direction pulleys with recoil springs insure the flywheels turn in one direction when the barge is lifted by the wave crests and re-wind the mooring belts back on the pulleys when the barge is lowered by the wave trough. The recoil springs maintain a fairly constant high tension load in the mooring lines at all times. 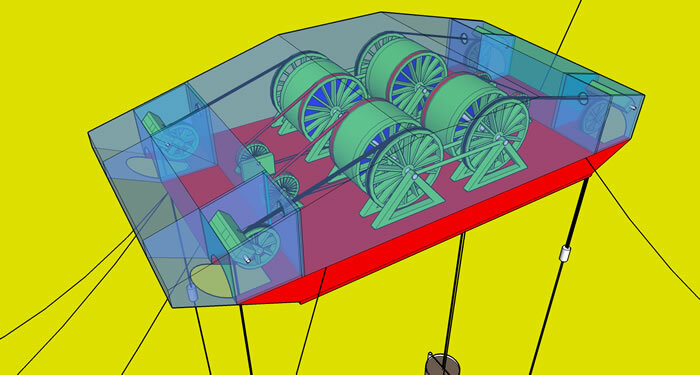 The Super Watt Wave Catcher Barges© use uni-direction pulleys that are twice the diameter of the Original Wave Catcher Barges©. 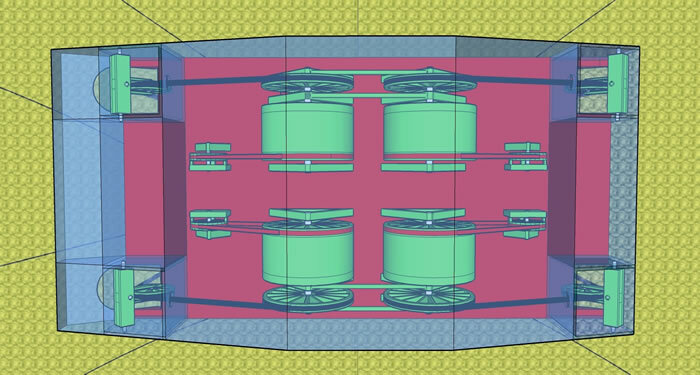 Doubling the uni-direction pulley diameter doubles the torque on the flywheels and the generators and contributes to doubling the power output of the Super Watt Wave Catcher Barges©. The Super Watt Wave Catcher Barges also have stiffer recoil springs. Large diameter recoil springs and flywheel combinations maintain the momentum in the system through varying wave loading in the same way that wind turbine rotors maintain the momentum in wind power systems through varying wind loading. Circulator recoil springs inside the flywheels are loaded with torque by the uni-direction pulleys. Circulator recoil springs are one of the most effficient torque storage devices. 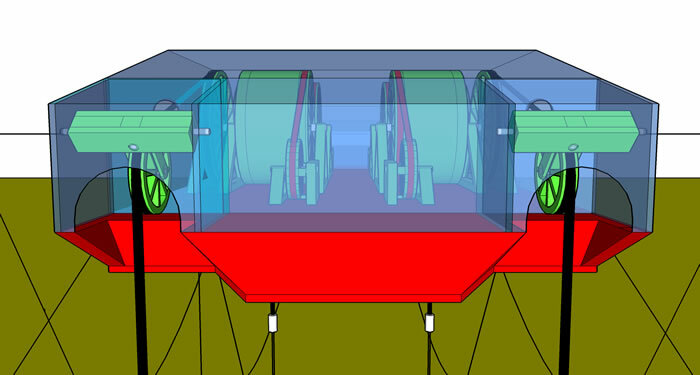 The flywheels are of a similar diameter to the uni-directional pulleys allowing both to fit under the same water tight enclosure roof height and allowing both to maximize torque and momentum storage. 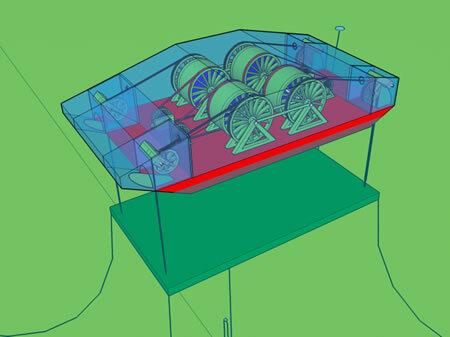 The Super Watt Wave Catcher Barges© use flywheels that are twice the diameter of the Original Wave Catcher Barges©. 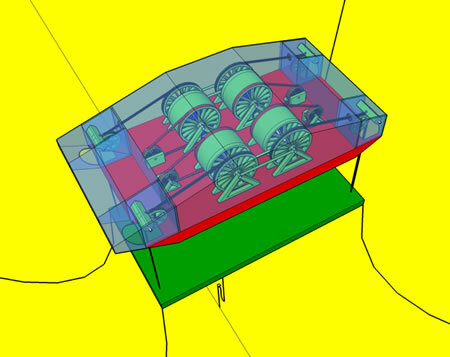 Doubling the flywheel diameter doubles the momentum applied to the generators and contributing to the Super Watt Wave Catcher Barges© power output increase. Thus the name change to "Super Watt Wave Catcher Barges©". 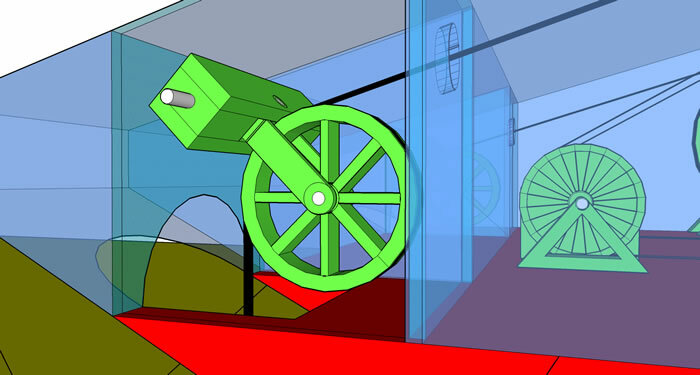 The flywheels are turned by the unidirectional pulley at one end of the flywheel, and the flywheel continues to turn freely as the unidirectional pulley's recoil spring rewinds the belt back on the unidirectional pulley during wave troughs. The opposite end of the flywheel turns drive generators either directly or through some form of belt of gear. 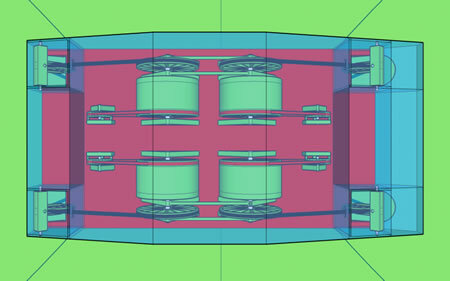 The flywheel's deflection and the vessel hull deflections are isolated and costs are reduced by using flexible drive connections, like belts, between the flywheels and the direct drive generators. 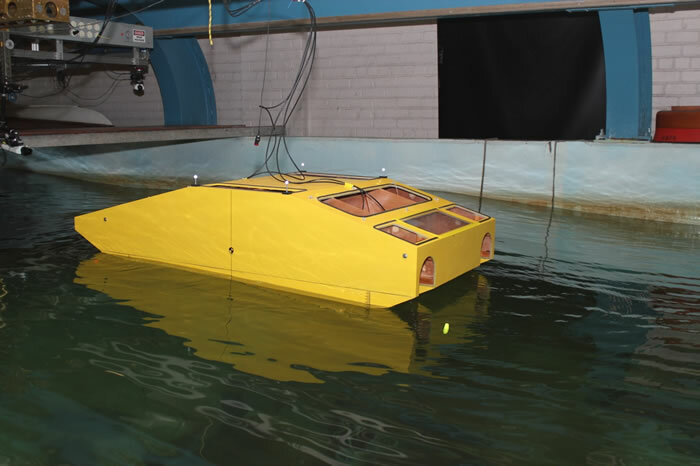 Computer analysis and 1/50th scale DOE sponsored wave tank tests confirm that these Super Watt Wave Catcher Barges© are able to produce the name plate power output from 4 of the world's largest direct drive wind turbine generators at a cost that is less than onshore wind power. 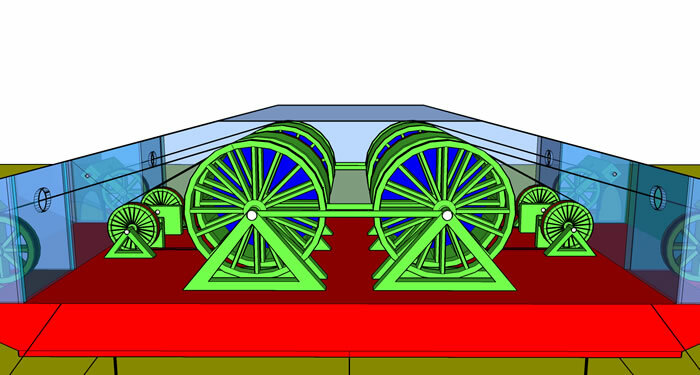 Using rubber belts between the flywheel and the direct drive generators eliminates any barge deflection and alignment tolerance costs related design requirements and introduces the possible future use of a CVT type transmission between the flywheel and the generators for peak performance under all wave conditions. MEC's own "Current Catcher Frames" which support numerous underwater marine current generators. 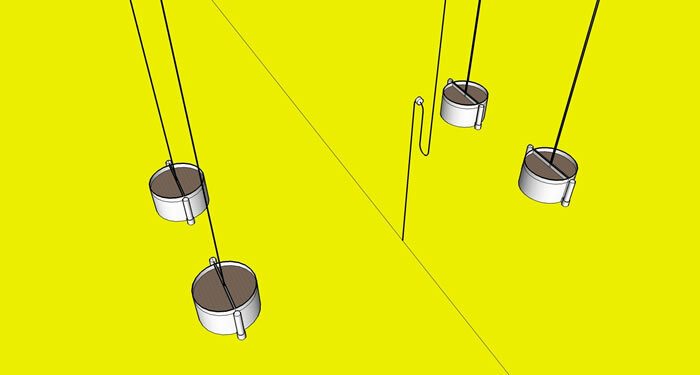 MEC has illustrated various mooring systems in their patent that can be used with the wave catcher barges, but many more are possible. 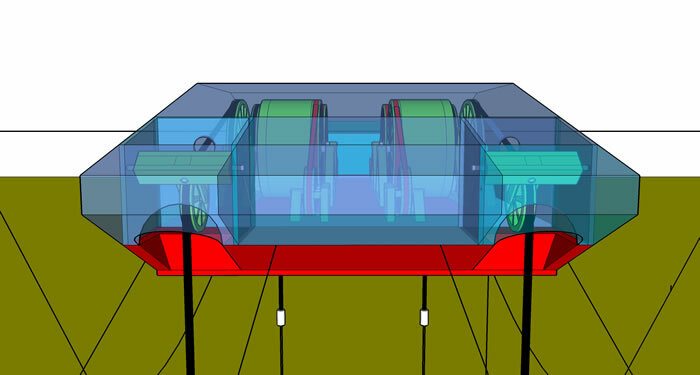 Several additional mooring systems are illustrated in the Super Watt Wave Catcher Barge© Brochure, the Super Watt Wave Catcher Barge© presentation, and the Super Watt Wave Catcher Barge© Overview which can be downloaded by clicking on the above links. Mooring systems are available that minimize vessel offset, minimize belt - hull contact and minimize vertical barge restraint loads while maximizing power output. Super Watt Wave Catcher Barges© which use fixed heading mooring systems align the barge with the prevailing swell wave direction. 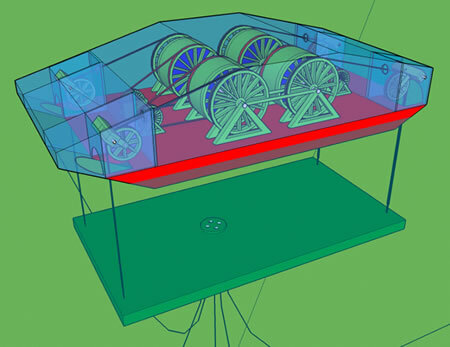 Computer analysis and model tests both indicate similar power output for head seas and quartering sea conditions when using fixed heading moorings. Super Watt Wave Catcher Barges© which use naturally weathervaning mooring allow the barges to weathervane into the strongest swell wave headings at all times maximizing the power output of the system. Export power cable configurations, used by the offshore industry for decades, are also available for both fixed and weathervaning mooring systems. 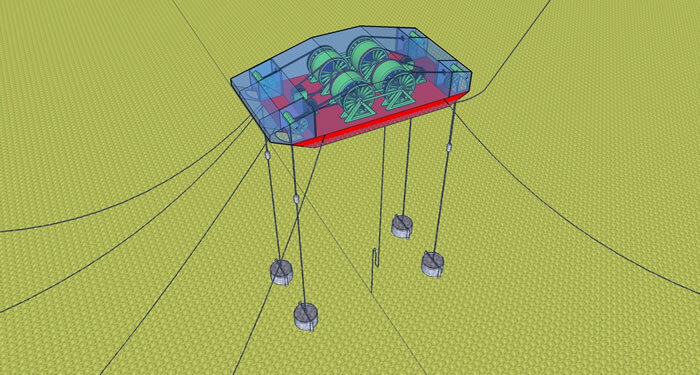 The following are a few illustrations of the latest Super Watt Wave Catcher Barge. More can be found on the new Super Watt Wave Catcher Barge© Brochure and the Super Watt Wave Catcher Barge© presentation. SWWCB© Shown Above Is Moored Horizontally Into Prevailing Waves. 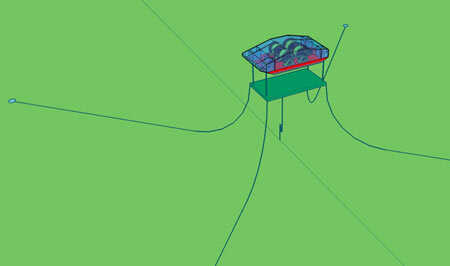 Click to view illustrations of the Original Wave Catcher Barges©.